The following positions are open on the PTA board for the next school year. If any of the positions interest you, we would love to hear from you. VP Beautification: Organize inside and outside improvement projects – coordinate with Mrs. Tesreau or her appointed faculty representative on project needs. Assistant Treasurer Assist the Treasurer with counting money, financial record keeping including reconciling bank account monthly, and other things as needed. Coordinate Incentives program, including: Box Tops program, Amazon Smile program, and Kroger incentive program, etc. bailey bear boogie sponsors: thank you! 2017 bailey bear boogie winners announced! Bailey Bears, show your creativity while teaching us about safety! Create a poster that fits the theme, “Safety can be fun”! Bring your poster to the BSE Library by Monday, November 13th. Forms can be downloaded here. "the most important thing about america"
Every year Tennessee PTA sponsors a Citizenship Essay Contest for literature. “The most important thing about America” is the topic for this year. Please encourage your student to write an essay which considers what they feel is the most important thing about living in America or what America means to them. Entries are due Thursday, November 16th in the BSE library. - Essays must reflect on the theme : “The most important thing about America”. Be creative! - Awards are given to the top 3 entries in each division. - Top winning BSE essays will participate in the Tennessee contest. - Write essay on standard lined notebook paper in pencil or ink. - Leave a space between each line of writing. - If someone other than the student types it, original work must be attached and verified on entry form. - Entry form must be filled out and signed by a parent or teacher verifying original work of the student. Click here to print out rules and entry form. - The contest starts on Tuesday, Oct. 17th, and the due date is Thursday, Nov. 16th. Please remember to attach the form to the entry and return to the school library. bailey bear boogie spirit days! Bailey Bear Boogie Spirit Days! Let’s team up together and show our school spirit! Wednesday, October 18th – wear your favorite BSE t-shirt or school colors (red and blue). All students will be receiving a red Bailey Bear Boogie (BBB) wristband. Check your folders for your pre-order form to get your Jerry Pallotta signed books! The deadline for the pre-order is FRIDAY, OCTOBER 6. Mr. Pallotta will be at BSE on November 2 bringing his zany sense of humor. Write a friendly letter to Mr. Pallotta explaining what you love about his books and your name will be entered into a drawing. Jerry Pallotta is an award-winning children's author. His combination of interesting facts, detailed research, humor, and realistic illustrations have mesmerized countless children across the United States. You can visit him at www.jerrypallotta.com. Welcome to the BSE Birthday Book Club! Families, you can donate a book to the BSE Library in celebration of your child, grandchild, niece or nephew! You will be giving a birthday gift that will be treasured by many, many children for years to come. Donors may write a special message on a donor plate that will be displayed in the front of the book. Books may also be donated in honor or memory of a loved one. When the book arrives, your child will be the first to check it out and we will display their picture. We can't wait to celebrate your child's birthday with a new library book! 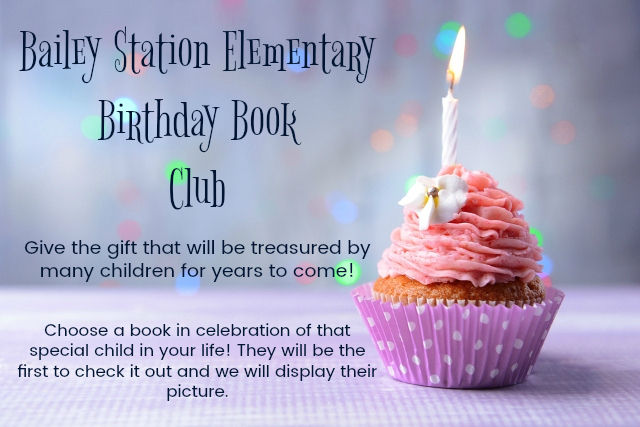 To join the Birthday Book Club, please go to: http://www.btsb.com/sosl/baileystationelementary1/ and click DONATE NOW to go to our wish list. it's bailey bear boogie time! The BBB is a one-day walk/run-a-thon event, held in the Bus Loop, with prizes based on pledges, school spirit, and participation. Students have 30 minutes to run, walk, or skip around the bus loop. This is the BSE PTA's biggest fundraiser of the year, with 100% of the funds used towards the new playground fund, technology enhancements and other programs for students and teachers. This year, 10% of classroom funds stay IN THAT CLASSROOM for supplies and classroom needs. Last year, we raised more than $35,000!! What?! Proposed maps to be published in advance of these meetings. Last month, in my newsletter, CLICK HERE, we talked a little about what we are doing as a school to support a growth mindset. I discussed how it was so important that we start to dismiss the myths about learning with our students. Too many of our students believe that they are NOT smart! As teachers and parents, we can fall into this type of thinking and make assumptions about a child's ability based on perceived deficits or because of race, low-income status, language acquisition and a variety of other factors. We have to put a stop to this type of thinking because it closes the door for so many students that if given the proper tools and the proper attitude could do anything they put their mind to. We will hold two coffee chats in the month of October for Part I of this study. We hope if you are interested you can attend one of the two offered in October to receive the information from Part I of our study. In order to best serve our parents, we are offering a coffee chat in the morning on one date and the afternoon on another date so that you can pick the time and date that best works for your schedule. The coffee chats will be held on Tuesday, October 17th from 4:45 - 5:45 in the library and Thursday, October 26th from 9:15 - 10:15 in Room 200 on the Blue hallway. We do not have childcare for either of these dates so please find alternate activities for your young children and if school age please do the same for the Tuesday evening meeting. If you would like to purchase the book Mindsets for Parents - Strategies to Encourage Growth Mindsets in Kids, please do so. I will not cover the whole book in our two studies but it is a great resource for parents in helping your children increase their effort, hard work, and perseverance to tackle difficult tasks/subjects. I look forward to working with you! Our Part II coffee chats on Mindsets will be on Wednesday, November 15th from 9:15 - 10:15 in Room 200 on the Blue hallway and on November 28th from 4:45 - 5:45 in the library. In order to have an idea of who will be attending the coffee chats so that I am prepared with enough material, I am asking that you sign up on the excel form that is linked below. You only need to sign up for one coffee chat in October for Part I and one coffee chat in November for Part II. Don't miss the annual BSE Bear Fair! Dunk your favorite teacher at the ever-popular Dunk Tank! Win a goldfish! (They seriously never die...ask me how I know.) Challenge your Mom & Dad to a mean game of Limbo! Giant slides! Dancing! Loads of fun! NEW this year: Silent Auction! Prepay for your punch cards for a discount and to avoid lines. $10/25 punches or $10/20 at the Fair. "But we need to eat," you say? We will have 3 food trucks on hand for all the nom noms you want and also, EAT ALL OF THE MEMPOPS! Strollers welcome; all children MUST be accompanied by an adult. September 2017 edition of Bear Tracks is ready! New design and format and full of info you need to know. don't forget your "Go, Jim, Go!" donations this week! Go Jim Go is a 6-day telethon on wheels featuring Jim Jaggers, WREG News Channel 3 Meteorologist. Jim and the Go Jim Go Cycling Team ride 333 miles throughout the region raising money for Le Bonheur Children's Hospital. Since its inception, Go Jim Go has raised more than $2 million for Le Bonheur. Each day, BSE students will compete to be grade level winners for a prize! Five young students in Collierville have been chosen among the Top 100 Readers in Tennessee by First Lady Crissy Haslam, and 3 hail from Bailey Station Elementary! The Read to be Ready Summer Reading Competition started on June 1st and ended on July 28th. Students in kindergarten to 4th grade were challenged to keep track of how much time they spent reading during their summer vacation and to submit the times to the contest. Winners attended a Kid’s State Dinner at the Tennessee Residence in Nashville on Friday, August 18. Collierville’s winners include 6-year-old Sunaina S. Shetty (pictured). Sunaina logged 150 hours reading time, or approximately 277 books this summer. She enjoys all kinds of books, but likes fiction the best. Sunaina is in the first grade at Bailey Station Elementary School this fall. Besides reading, she enjoys drawing, telling stories and swimming. Samit Chaubel, 2nd grader, (pictured below) had 75 hours of reading time by the end of the contest. He is 7 years old and in the second grade. Samit particularly likes non-fiction books about nature, the human body and the planets and solar system. He also enjoys biking, Legos and playing chess. Neil Jana, in the fourth grade at Bailey Station Elementary School, was also recognized as one of the Top 100 Readers in Tennessee. bse run club is back! Please help fill the truck this Labor Day Weekend! reflections contest theme: "within reach"
Bailey Station PTA is proud to continue our participation in the National PTA Reflections Program. The Reflections program is a national arts recognition and achievement program that encourages students to explore their artistic talents. The Categories include: Visual Arts, Literature, Music, Photography, Dance Choreography and Film/Video Production. All works of art will be judged by professionals in the respective art areas. Selected works will be advanced. Forms will be sent home this week. On Friday, October 20, 2017, Bailey Station Elementary will host our biggest fundraiser of the year, Bailey Bear Boogie (BBB). BBB is a PTA sponsored fun run/walk that the students participate in to raise money for our school! It is a student-favorite and is highly anticipated each year. More information will be coming home soon. Along with donations, it takes many parent volunteers to make BBB a success! If you are interested in volunteering please contact Karen Hoover at karen_hoover@hotmail.com or Karen Johnson at karen.king123@yahoo.com .